NEW TO MARKET! 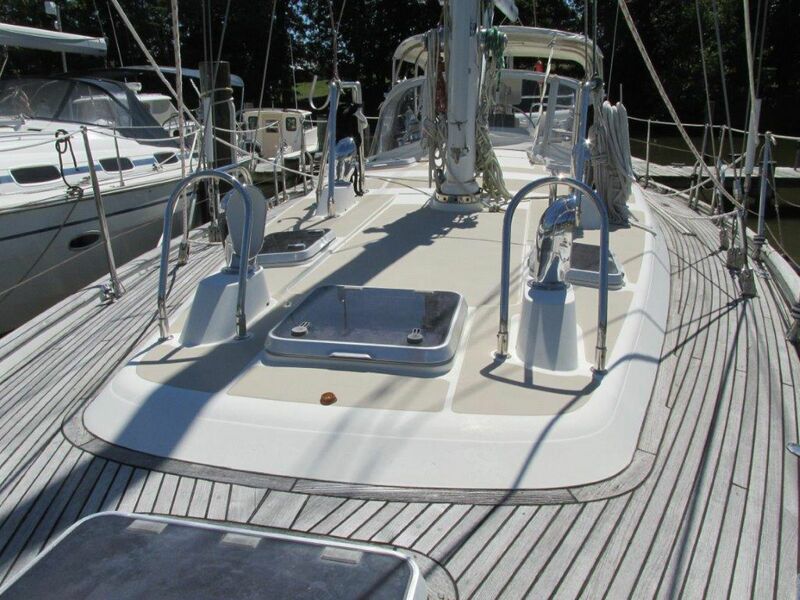 THE PERFECT BLUE WATER CRUISING YACHT! NEW UPHOLSTERY BEING INSTALLED IN SALON! 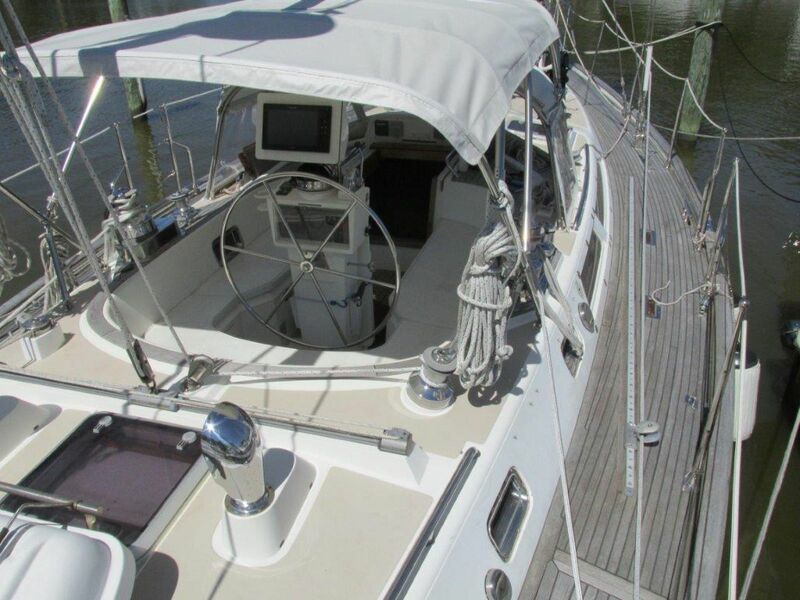 CARINA is a beautiful, professional cared for Taswell 50 with many custom features. She is one of the most customized Taswell 50’s ever built. Her original owner was very involved during the build process making several trips to the Ta Shing Shipyard, one of the world’s finest yacht builders. 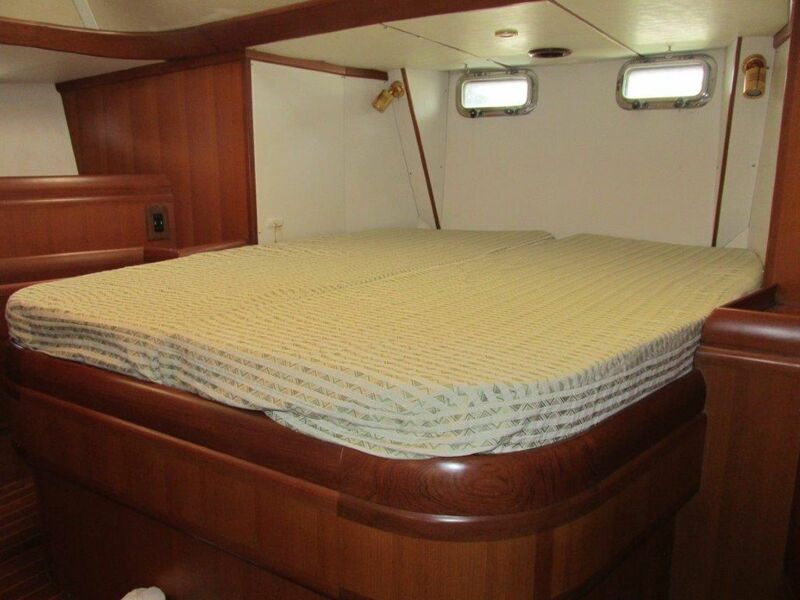 CARINA’s interior arrangement offers many improvements including a larger navigation center, expanded galley, custom salon with lounge seats and coffee table to starboard and custom facing settees and dining table to port. The talent and experience of CARINA's designer, Bill Dixon are evident everywhere. 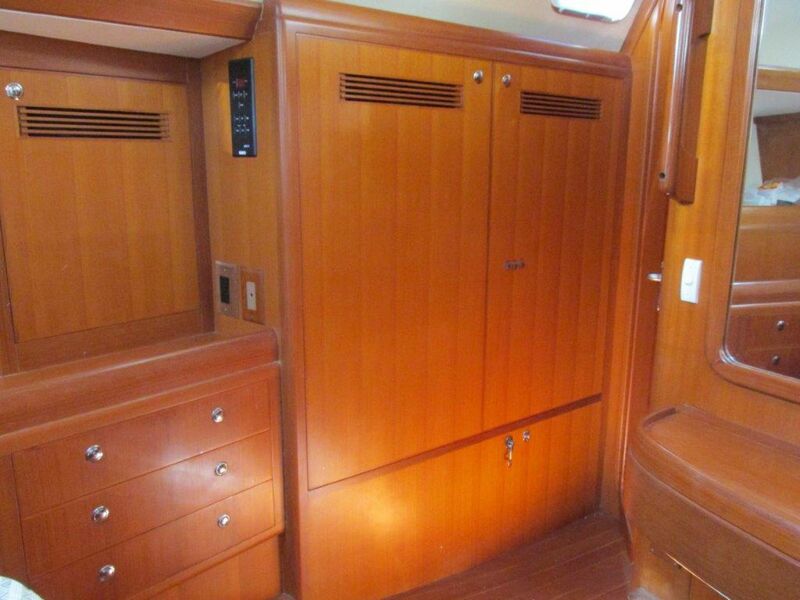 Her deck layout and styling, exquisite interior joinery and fast sea kindly hull design. One of my favorite designers Bill Dixon seems to find usable space other designers ignore or overlook. CARINA is no exception! There is extra storage in every cabin, especially the galley, all berths are longer, wider, beautiful matched grain varnished teak woodwork throughout and a teak cabin sole with contrasting inlay. The interior offers living space comparable to much larger yachts. The interior is filled with good light and ventilation throughout. 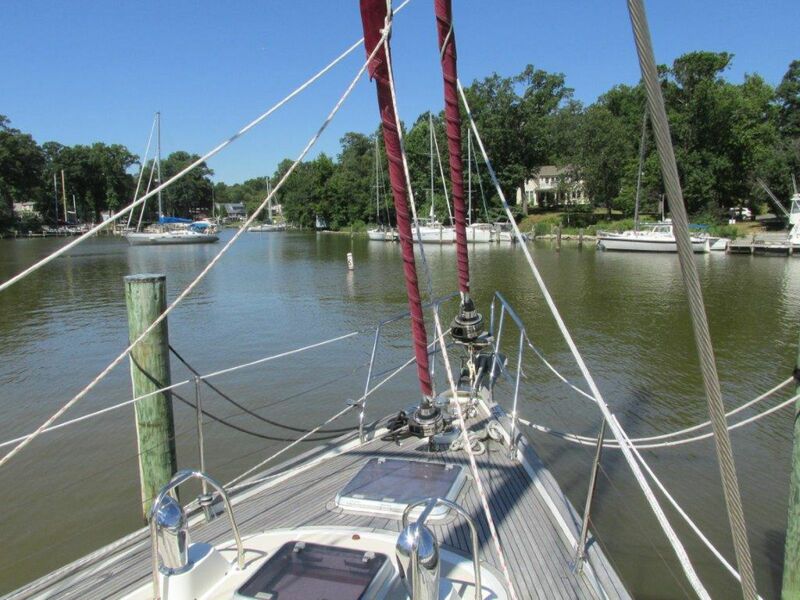 The patented Scheel Keel allows access to many additional harbors and anchorages not usually accessible to 50’ yachts. 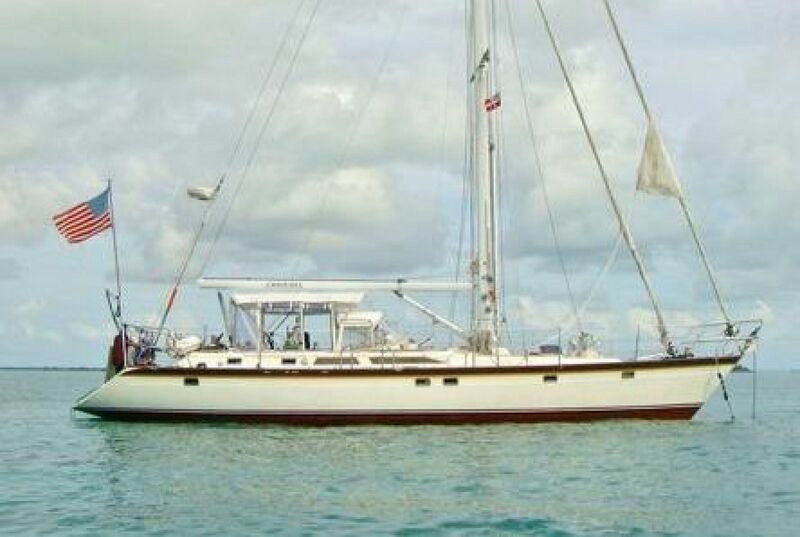 A Stoway mainmast, electric winches, manual jib and staysail furlers and bow thruster make shorthanded sailing a breeze. Fuel and water capacity have been increased with the addition of custom tanks in the salon and second guest cabin. 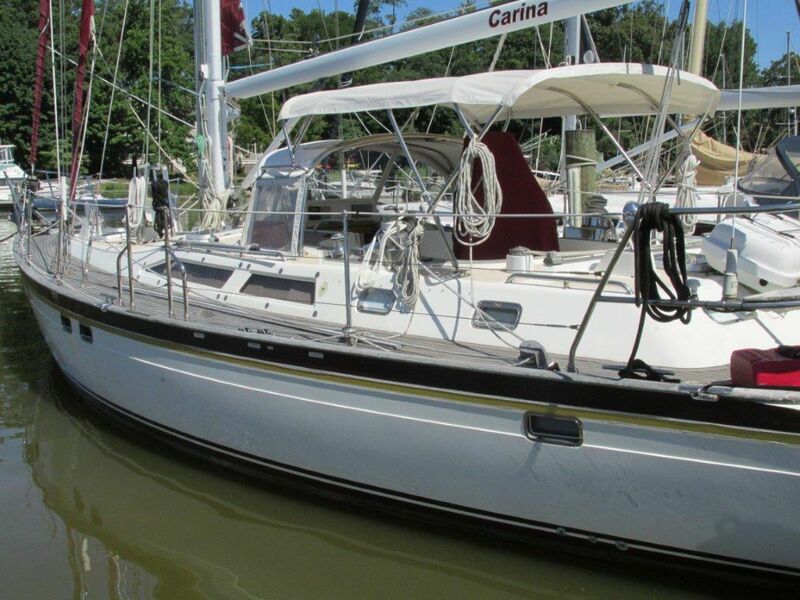 CARINA is the ultimate cruising yacht for a couple or a crowd, making coastal passages or world-wide passage making. SHE IS A MUST SEE FOR THE SERIOUS BLUE WATER CRUISER! Starting forward with a full beam guest cabin. 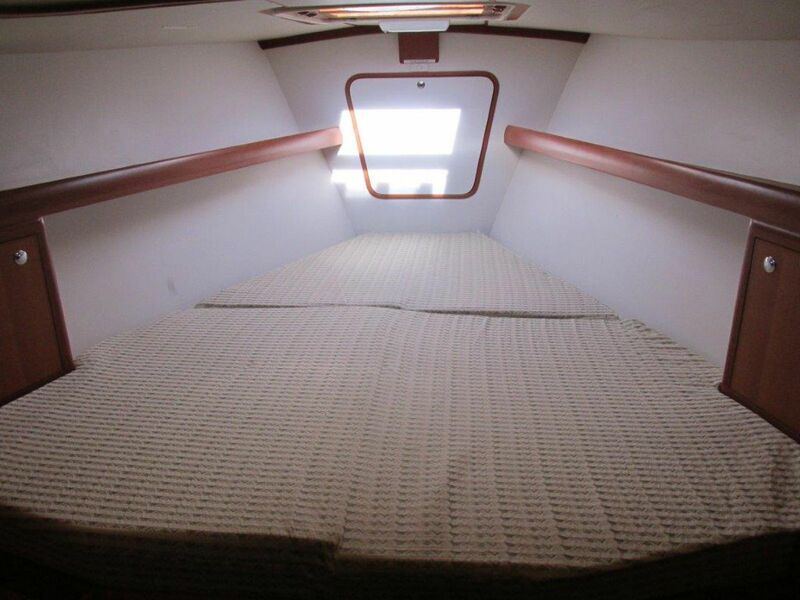 The large double berth is extra long and wider than most. 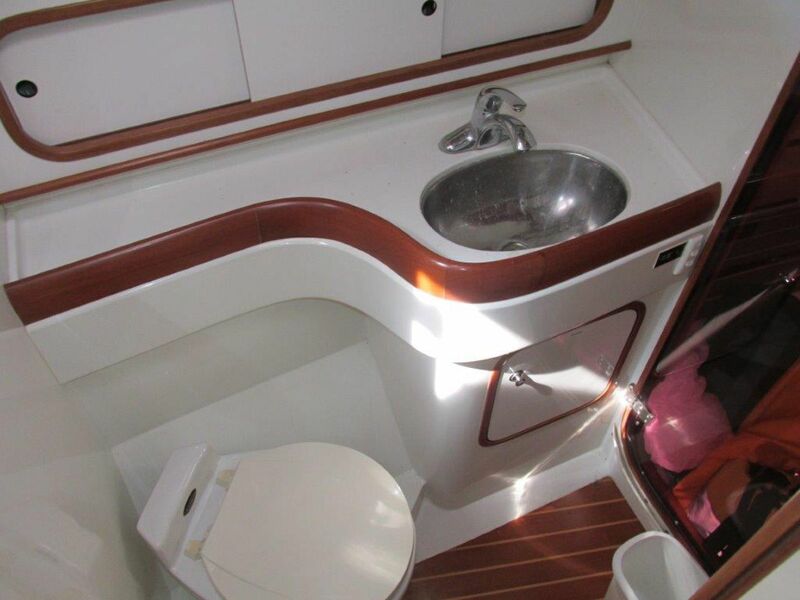 Just aft and to port is the second guest cabin with a large raised single berth and good storage. 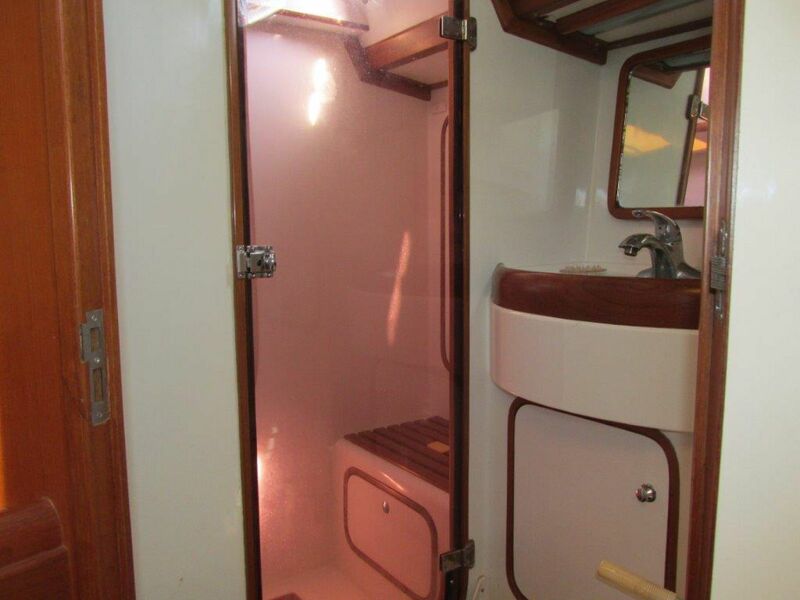 Across the passageway to starboard is the guest head featuring a separate stall shower with acrylic shower door, Vacflush head, vanity with Corian counter top and medicine cabinet. To starboard with coffee table. Outboard of the seating both port and starboard are shelf lockers with Corian surfaced shelving with teak fiddles and additional storage under the shelves. The custom Nav station is aft of the salon to port with wide desk and storage under the hinged desk top, a comfortable swivel chair allows easy access. 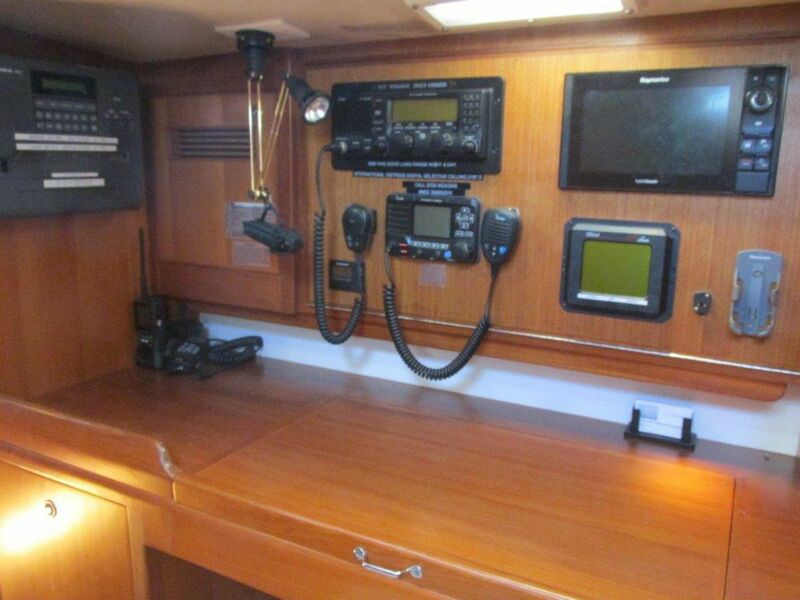 An array of instruments and radios are outboard and above the nav-desk. The boat can be operated entirely from here in bad weather. The Bass electric panel and Panda Generator controls are above the engine access doors. A total of six access doors surround the engine and generator making access very easy. 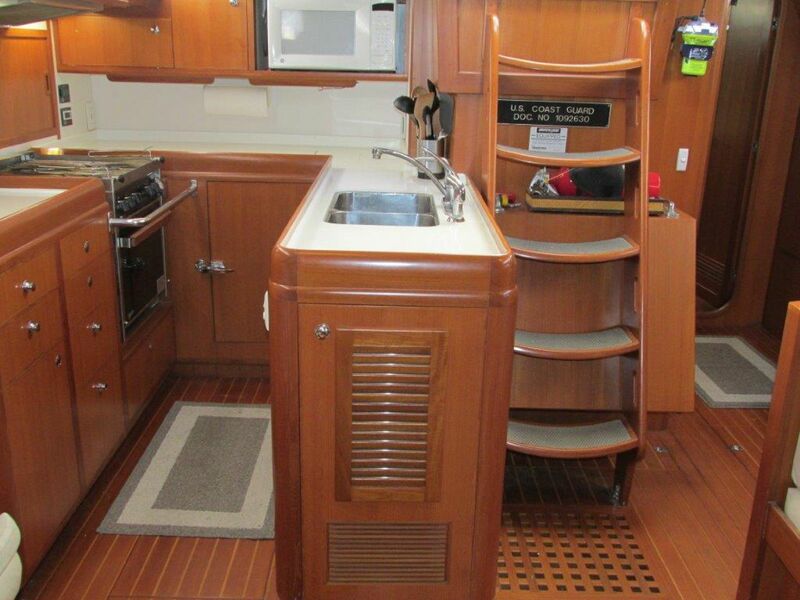 To Starboard is the impressive U shaped galley. Featuring extended counter space, double stainless steel sink, three burner stove with oven, stainless steel hood with power vent to the exterior, microwave, multiple storage lockers and drawers (all drawers are much deeper than normal for extra storage) and a trash locker adjacent to the sink. A Raritan ice maker is located between the galley and the dining area. This galley counter space rivals most homes. 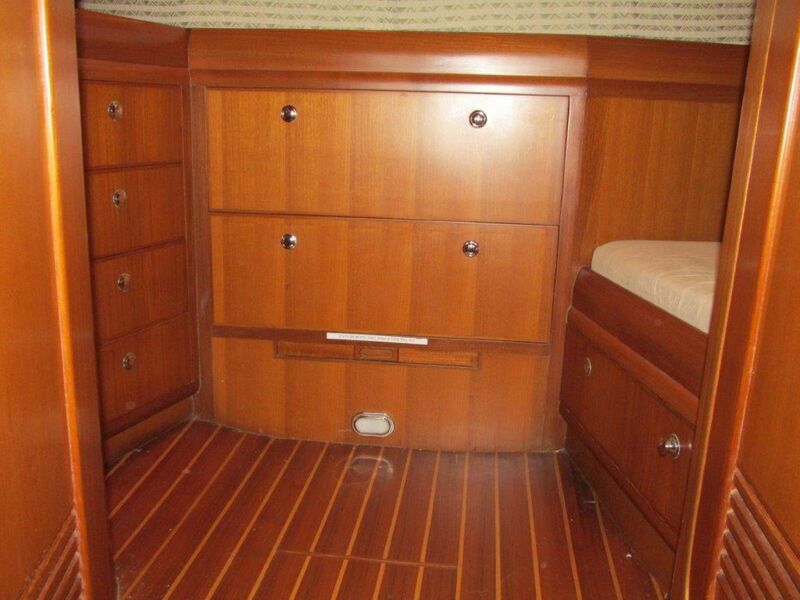 The luxurious aft cabin features a wider, longer queen berth and two chests of drawers. A full length mirror plus dressing table with swing out swivel seat and a large second mirror set against the forward bulkhead. The ensuite head includes a vanity with medicine cabinet and separate stall shower. Outboard of the shower beneath towel storage is the Spectra watermaker. The head is hand operated and provides the option of ElectraSan waste water sterilization treatment or direct overboard discharge. Vanity with large mirror, swing out seat and storage drawers. Full length mirror. A very large cedar lined hanging closet. 6 drawer bureau to port. Cantalupi dimmable overhead lighting with additional reading lights. Head with stainless steel sink and locker behind mirrors, Corian counter and separate stall shower. Large overhead hatch with retractable screens and sun shades. 5 opening ports (2 open aft from bed), 3 fixed glass ports. 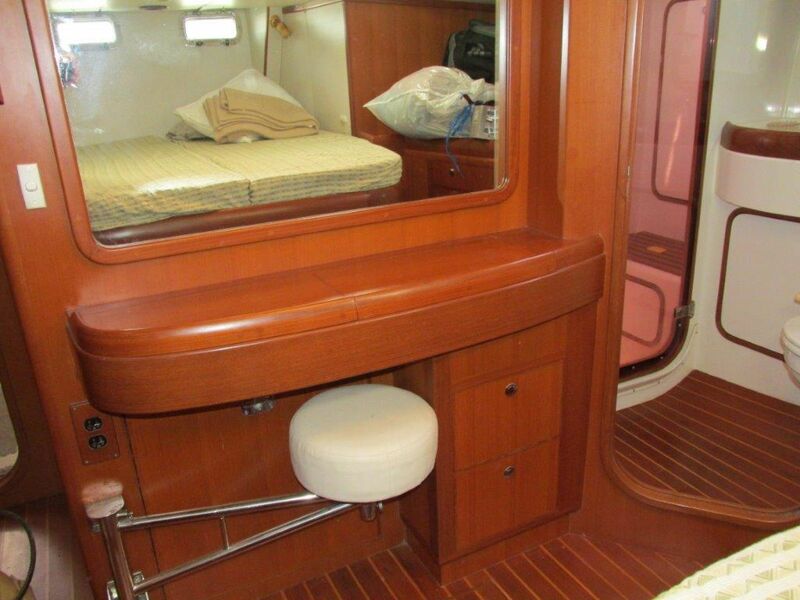 2 large drawers under berth. 2 long open shelves alongside berth. 5 additional drawers. More storage space beneath berth. 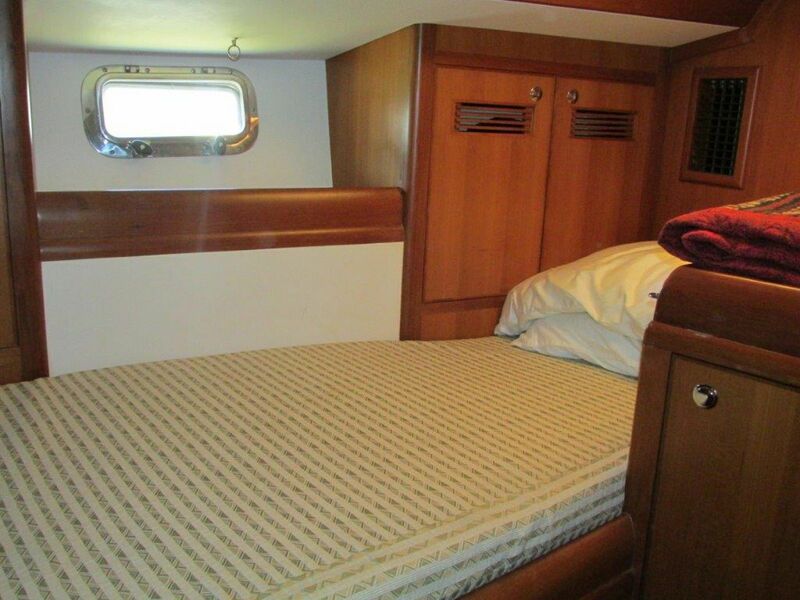 Large single berth with large open shelf alongside. Drawer bank with lighted mirror above. Overhead lights plus reading light. 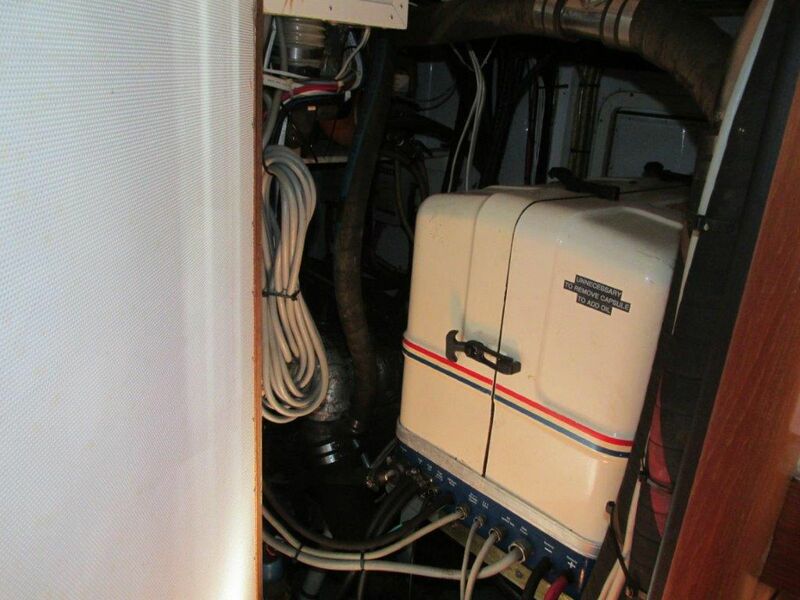 Port side deck locker accommodates two standard 20 pound propane tanks with fully compliant shutoff sensors. Custom office layout with hanging file drawer, navigation table with opening top to access storage under the table, chart storage pockets. 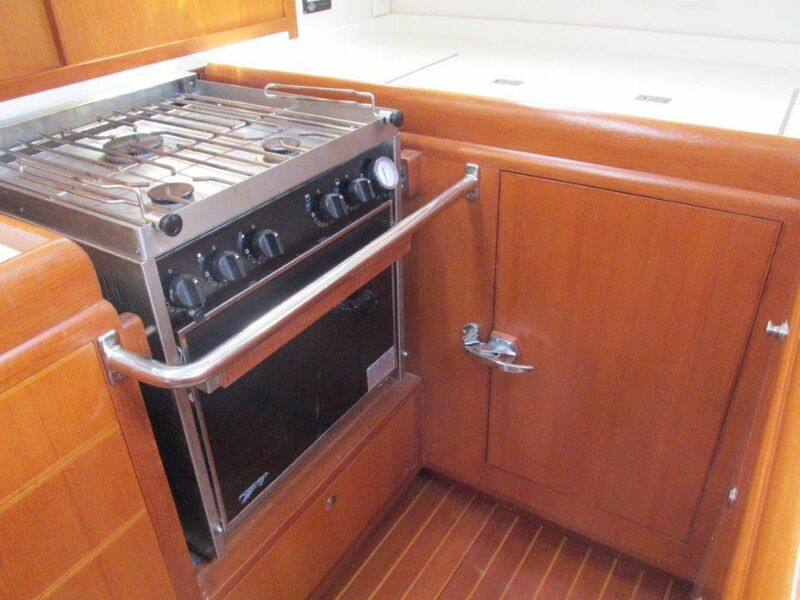 The navigation center is adjacent to the companionway with flush mounted electronics, 12 volt and 110 volt Bass electric panel, monitor gauges for fuel and water, and inverter and battery control panels. Nav station desk chair and large spares cabinet. Raymarine AIS system networked with other instruments. 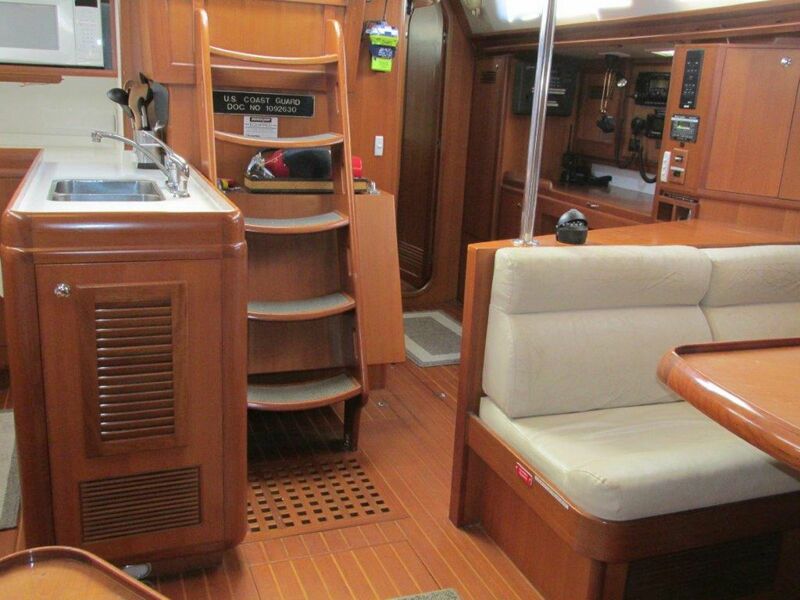 Console above the companionway with 4 Raymarine instruments including depth, wind, speed & autopilot functions. 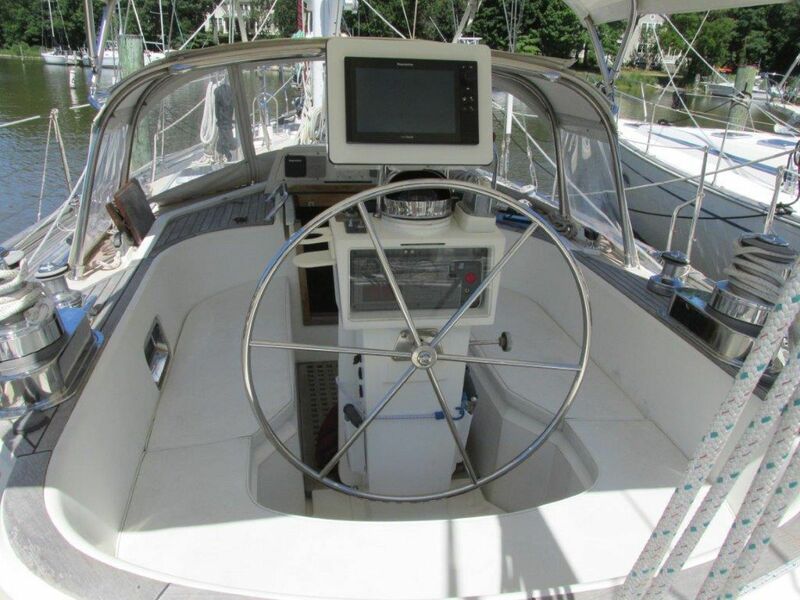 VHF Radio, Autopilot, windless, in mast furling, and bow thruster controls at helm. 12 volt DC and 110 volt AC electrical systems with Bass breaker panel (33 DC breakers, 11 AC breakers), volt and amp meters, polarity indicator and battery condition dial. 1 Fresh water pump for interior use- Shur Flow with 2 accumulators. Solid fiberglass construction with transverse and fore and aft stringers. Includes skeg supported rudder and solid cast lead shoal fin (Scheel) keel. 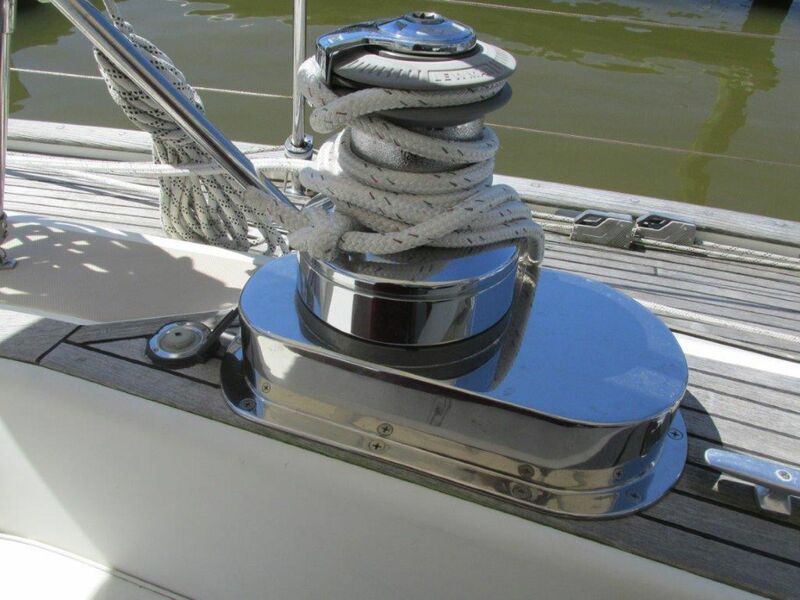 Patented keel design improves windward performance with reduced draft. Center cockpit design with three storage lazarettes aft and one chain locker forward.